Can you please advise what type of battery is required for this probe? This thermometer requires a 3V battery. Ensure every meal you present is cooked to perfection with our Dishwasher Safe Waterproof Thermometer. Designed to be used as a conventional food probe, this handheld tool features an easy-to-grip plastic casing with a digital screen and a long metal probe for inserting into meats and other foods. 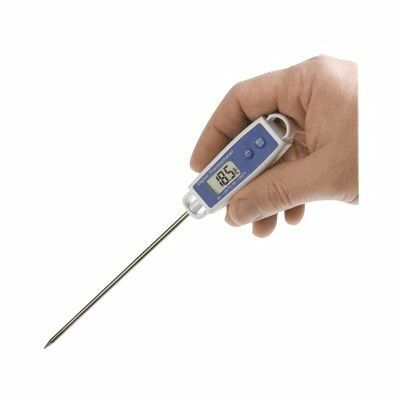 Effective at reading accurate temperatures between the range of -49.9°C to 199.9°C with a 0.1°C resolution, this compact thermometer has a waterproof casing which allows it to be calibrated and cleaned in any dishwasher. For protection during storage, the thermometer is supplied with a probe cover and a wall bracket ensuring that it is always hygienically sanitised for further use. Clear to read digital screen accurately records temperatures between -49.9°C to 199.9°C with a 0.1°C resolution. Here at Gompels, we stock a wide range of thermometers for all your needs including a Bath Thermometer for the safety of your residents and a Room Wall Thermometer to keep track of your surroundings.